Why is that so and who are we anyway? The Irish have green eyes that smile and, if they’re not Danny boy they’re a sweet colleen. The Brits wear bowler hats, carry furled umbrellas and have a Queen whom they share with us. The Germans lost the war but won the peace. The French have a big Meccano set and chew garlic. The Americans sport 10-gallon hats, lasso innocent calves and shoot from the hip. The Chinese are ubiquitous and once wore what we called pigtails and they call a queue. Are we bronzed Anzacs or black blacks standing on one leg and supported by a spear? And how many of us are indigenous? Indigenous: a. 1646. [f. late L. indigenus (f. indigena : see prec.) + ous.] 1. Born or produced naturally in a land or region; native to (the soil, region, etc. ), b. transf and fig. Inborn, innate 1864. 2. Native, vernacular 1844. So I’m an indigenous person. Born in Ballarat and moved around Australia for the last 74 years. So are my children indigenous. My grandchild is also indigenous. Born in Melbourne. His father, like mine, was born elsewhere. My pater was English, my grandson’s Ghanaian. Both my mum and his are indigenous as they were also born in the Lucky Country, good old Oz..
Apart from my grandson, who is fuzzy haired, has a watermelon smile and is a wonderful all-over chocolate hue, and his father whom we call Liquorice, the family is pale pink …. And get pinker the more we stay in the noon day sun. Mad dog a white man, eh? Now, dear reader, to the point. Am I any more Australian than, say, the Greek who arrived here at the age of 25 and worked as a fish-monger in the markets, or the Italian Nino Cullotta look alike who came out with his family and worked as a concreter for the building trade? Or my wife who arrived here at the age of 17 and has worked flat out like a lizard drinking ever since – she’s now going on 76. And, by the way, a proud naturalised Aussie. You see, like all things, Australia is evolving from a country to which the original inhabitants walked, to a modern place peopled by a mixture of folk who have also chosen to come here to seek a living. Well I do believe in the spirit of Australia. Our Aussie uniqueness is exactly because we are a recipe made up of many and varied ingredients. And, like all recipes, we will keep evolving as the mixture changes due to various and varying circumstances. We still retain our irreverence for over-bearing authority, our ‘give it a go’, our ‘up yours’ and ‘she’ll be right, mate’ and ‘get off the table, Mabel, the money’s for the beer’. As you know, the first homo sapiens spread from Africa’s Rift Valley across the Middle East into China and then Asia and eventually wandered into Australia. Of course some went into America and kept going right down to the southernmost tip of South America. They’d walked across the land bridge to what is now Alaska. When that bridge and the land bridges north of what is now called Australia submerged, the Aussie Aborigines had this whole dry continent to themselves – apart from the roos and their mates, that is. 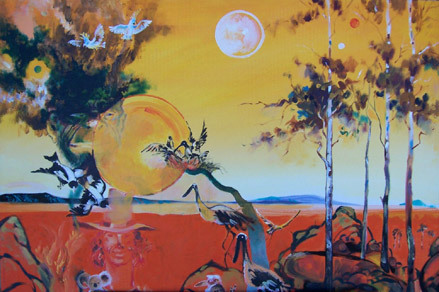 The belief systems that centre on the Dreamtime are far older than the monotheistic faiths of Judaism (5000 years), Christianity (2000 years) and Islam (1300 years). 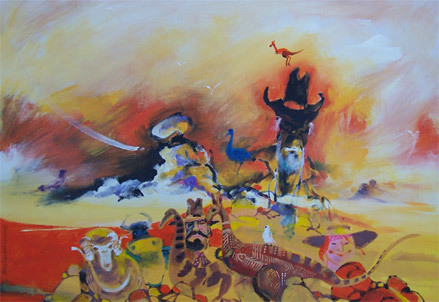 The Dreamtime contains marvellous explanatory stories about the creation of the land, people and animals, and a lot of it makes more sense than the mind stretching stories of God impregnated virgins or Mohammed riding his white horse into Heaven to frolic with more virgins than seems prudent. 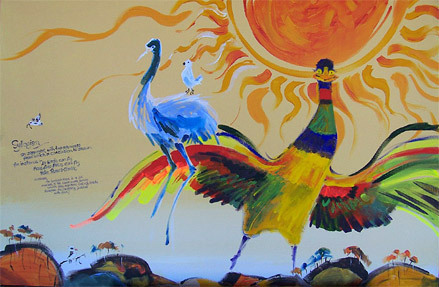 Among indigenous groups of North Australia, those creation stories include reference to earlier journeys of migration. Interesting, eh? So, like my father, they came from somewhere else and decided it was honky dory and set up camp. Now that rising water of yesteryear not only submerged passageways between land masses, it also cut off the Aborigines in Tasmania, so they developed separately – or until the pink people arrived and wiped them out. So all these first people were effectively cut off from the technicalogical development and cultural advancement which was happening in the rest of the world. Mind you, Malay fishermen dropped in after beche de mer (sea cucumbers). The Chinese, Dutch, Portuguese and, some say, Egyptians also dropped in but scampered quickly because of the inhospitable climate, terrain and possibly the inhospitable people too. But all that was happening in the west and the north. It wasn’t until 1788 that the British Government decided to drop kick out of Britain 759 convicts along with accompanying marines, soldiers, explorers, farmers, all armed with guns and disease. Except the convicts had no guns. This happened on the east coast which, as we know, is a far softer welcoming environment than the west and north coasts. They immediately loved Australia and pledged allegiance to it by having a slap-up barbecue. This invasion of course became a nightmare for the original blow-ins. Disease and bullets, along with their tucker supply drying up, caused much angst. But some, not many, survived. So, too, with the convicts and their keepers. Some survived but many starved as the British forgot to send them supplies as they were engaged in yet another war with their Continental rivals, the French. To say nothing of their belting the Irish..
Poor old Governor Arthur Phillip did his best. And the Rum Rebellion happened and Governor Bligh was caught hiding under his bed, the Blue Mountains were crossed, the inland sea was exposed as a myth, gold was found and the Chinese and many others rushed in. Bushrangers sang “Your money or your life!” …. in some cases “your wife!” An Aussie labourer, Albert Jakka, won the VC at Gallipoli, the first woman (a West Australian) won a seat in Parliament, Ginger Mick sold rabbits in the Vic Market and the tense moments of the Second World War produced Paterson and Lawson. There isn’t enough time to list all the defining moments in the growth of our Australia. Or to list its many heroes, like Shackleton, Burke & Wills, Cathy Freeman and others. And anyway, you probably know most of them. If not, read our paper currency..
And you probably know that it’s the result of all those incidents that have shaped a truly unique people. And what is even more amazing is that most of the newcomers to Australia are fiercely loyal to their adopted country. They truly love Australia. Of course they nurture their original country’s customs. Nevertheless they proudly proclaim themselves Aussies. So you see, even though we are constantly evolving, we are still retaining our values. We are remaining Australians. A land of pie and sauce. ‘n’ footy ‘n’ cricket of course. And all this girt by me and you. Who is Sylvia? What is she? …… and you could ask the same about Peter Russell-Clarke. And add - who cares? The answers are: PR-C’s a little bearded bloke who writes and draws either with a pen or paint brush. Both are said to be colourful. As to who cares – that’s easier to answer – ME!! I cared when I was the political cartoonist for the Melbourne Herald. I cared when I took over the writing and drawing of the comic strip Ben Bowyang. And when I wrote, produced and presented 900 shows for the ABC and 150 for SBS. And wrote and illustrated 24 cookbooks and short stories by the hundreds. And the painting exhibitions I’ve held here and abroad. But most of all I care for my wife Jan, my daughter Wendy (44), my son Peter (42) and my grandson Tarik (15).